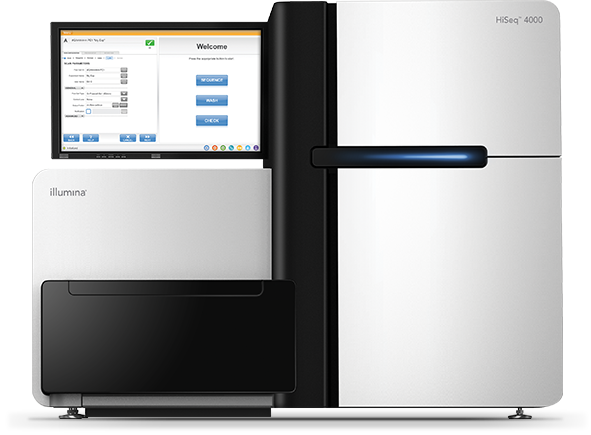 The Illumina MiSeq system has a wide variety of focused applications: targeted gene sequencing, small genome sequencing, 16S Metagenomics sequencing, amplicon sequencing, etc. 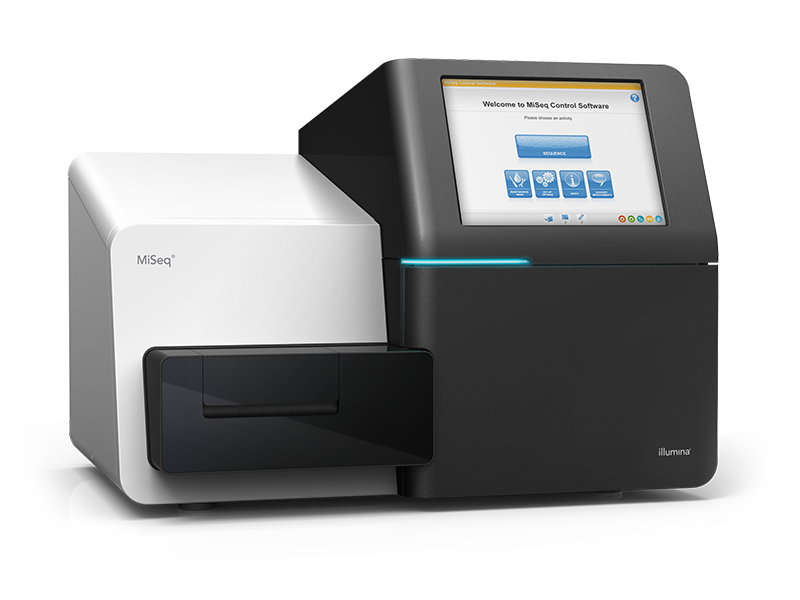 The unique chemistry of the MiSeq allows for sequencing up to 2×300 bp read lengths. The cluster generation process on cBot has been significantly streamlined. 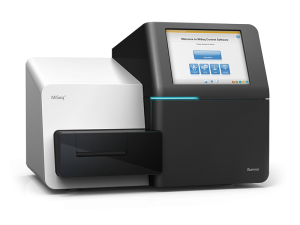 Innovative features such as pre-packaged reagents, a single flow cell manifold, and integrated touch screen controls make the best next generation sequencing workflow even better. cBot isothermally amplifies cDNA fragments that have been captured by complementary adapter oligonucleotides covalently bound to the surface of Illumina flow cells. Flow cells facilitate access of bound DNA to enzymes while ensuring high stability of surface-bound template and low non-specific binding of fluorescently-labeled nucleotides. Attached DNA fragments are extended and bridge amplified to create hundreds of millions of clusters, each of which contains ~1,000 identical copies of a single template molecule. Most user supplied RNA or DNA samples (depending on the specific protocol followed and source material provided) are initially QC checked using the Agilent Bioanalyzer 2100 and/or the NanoDrop ND-1000 spectrophotometer. 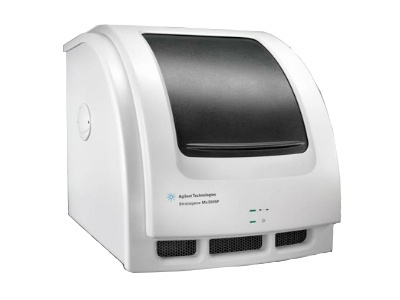 The Agilent Bioanalyzer 2100 offers a microfluidics-based platform for rapid analysis using only a very small portion of your provided RNA\DNA samples. 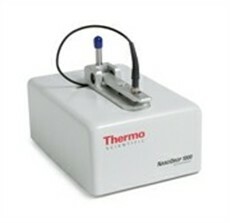 For further information on this instrument and its capabilities, please check the Agilent Bioanalyzer 2100 webpage. 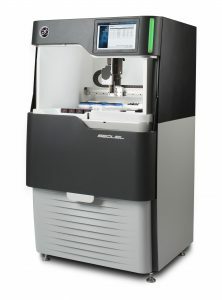 Cited in more than 3000 publications, the Agilent Mx3005P and Mx3000P QPCR Systems are the most flexible—and reliable—instruments available for gene expression analysis, microarray data validation, SNP genotyping, pathogen detection, DNA methylation analysis, and chromatin immuno-precipitation studies. 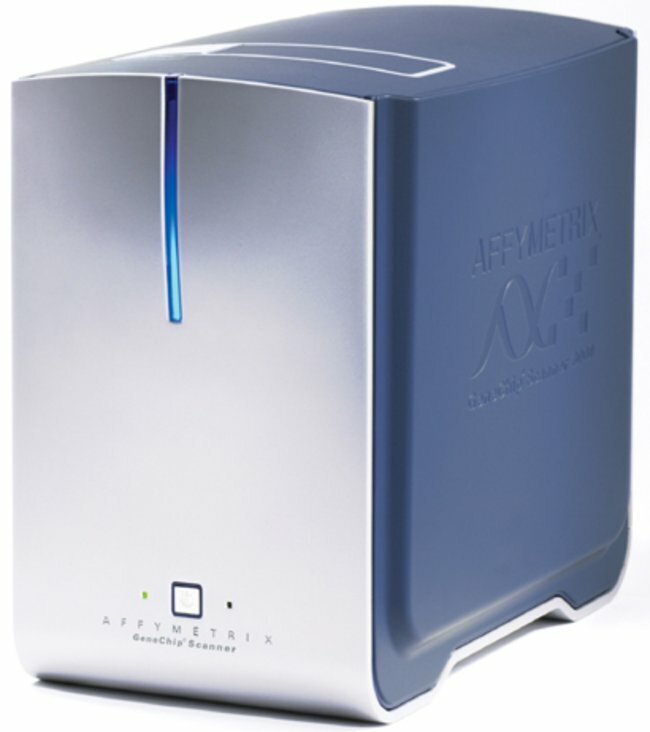 Agilent’s qPCR software, MxPro, provides users with an intuitive interface, quick experiment design, powerful data analysis and easy report generation. Agilent Mx3005P real time PCR webpage. 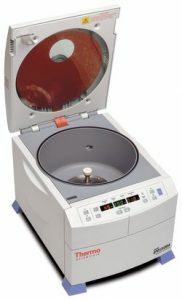 There are many brands of spectrophotometers (and infrequently calibrated) in use across laboratories, departments and institutions, each with varying degrees of accurate capabilities in reading small quantities of precious samples. We strictly rely on our Facility’s NanoDrop ND-1000 spectrophotometer when assessing the quantity/concentration levels of all user supplied samples. Our calibrated ND-1000 enables a uniform method for highly accurate analyses of extremely small samples with remarkable reproducibility. For further information on this instrument and its capabilities, please check the NanoDrop ND-1000 Spectrophotometer webpage. Depending on the precise assay protocol being followed, we ask users to make available a specific amount of sample material at a defined concentration. When users don’t, or are unable to supply samples that meet established guidelines, the Facility’s Speed-Vac Concentrator with UVS400 Universal Vacuum System is used to concentrate provided nucleic acid materials. This method is preferred over EtOH precipitation approaches as there is no loss of precious material and no chance of added remaining salt contamination effecting downstream enzymatic processing steps. The PacBio Sequel is based on a novel single-molecule, real-time technology which enable the observation of natural DNA synthesis by a DNA polymerase in real time. The sequencing occurs on SMRT cells each containing thousands of zero-mode waveguides (ZMWs). The ZMWs provide a window for watching the DNA polymerase as it performs sequencing by synthesis. The Sequel is amplification free and capable of multi-kilobase reads. Applications include de novo assembly, analysis of epigenetic modifications and characterization of genomic variation including repeat expansions, full length transcripts and splice variants, compound mutations and haplotype phasing and SNP detection and validation. GeneChip Hybridization Ovens 640 and 320 – for overnight hybridization of target RNAs or DNAs with the DNA oligo probes found on an Expression, Exon, Tiling or Mapping/SNP GeneChip array. Three GeneChip Fluidics Stations 450. 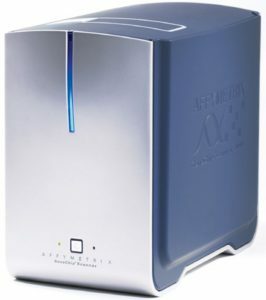 Each is capable of processing up to four GeneChip arrays at a time, allowing for automated washing and staining protocols of the hybridized arrays. GeneChip 3000 Scanner 7G with Autoloader installed and a dedicated dual processor computer workstation for scanning the resulting arrays and quantifying the amount of bound target at each probe cell site of an array; the unit additionally acts as the controller for the GeneChip Fluidics Stations and Scanner. NanoString’s technology uses color-coded molecular barcodes that can hybridize to directly to different types of target molecules. This is a true digital detection technology that is capable of direct profiling of individual molecules in a single reaction without amplification. This technology is ideal for applications requiring efficient, high precision quantititation of hundreds of target molecules across a sample set. RNA analysis applications include gene expression, single cell gene expression, lncRNA expression, miRNA expression and Leukemia fusion gene analysis. Applications for DNA analysis include copy number variation and ChIP-String expression analyses. The first automated solution for single-cell genomics research, the C1 Single-Cell Auto Prep system employs innovative microfluidic technology to rapidly and reliably isolate, process and prepare individual cells for genome and transcriptome analysis. The C1 system isolates single cells into individual reaction chambers in Fludigm’s integrated fluidic circuit (IFC). The optically clear IFC allows for automated staining of captured cells and examination by microscopy for viability, surface markers or reporter genes. After staining, cells are automatically lysed and template is quickly prepared for qPCR or sequencing analysis. The applications for this system include, gene expression and single-cell genomics. 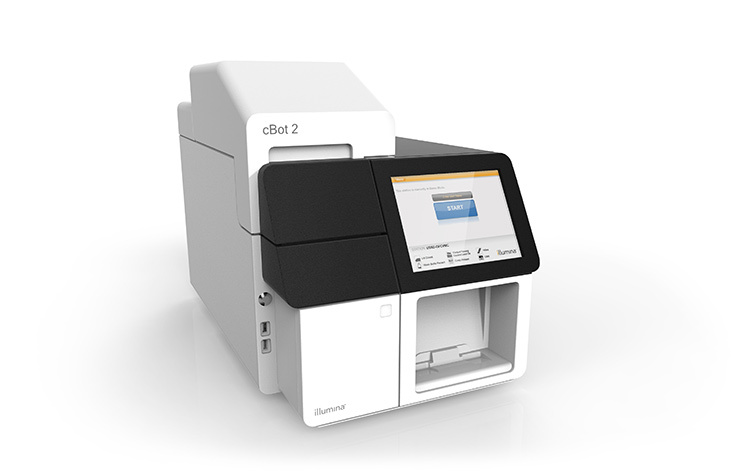 The chromium controller can encapsulate individual cells or genomic DNA into addressable partitions, each with a identifying barcode for downstream analysis. The proprietary GemCode technology utilizes a droplet-based system to capture from 100-100,000 cells in a 10 minute run. Up to 8 samples can be processed in parallel.